Station 35 is centrally located at 1322 College Pkwy and is home to Engine Co. 35 and Battalion 35. Also available is Boat 35 for additional rescue capabilities. 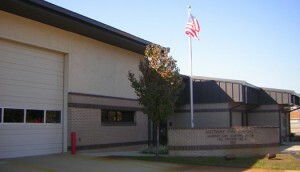 Station 37 is located on the east end of the District at 1801 Abercrombie Rd. and is home to Engine Co. 37. Also available is Truck Co. 37 for additional rescue capabilities. Midway Fire District Board of Commissioner Meetings are scheduled for the second Tuesday of each month at 6:00 pm. 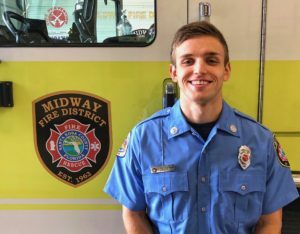 Firefighter/ Paramedic Ty Tolbert was hired in early 2016 and quickly obtained his Florida EMT and Pump Operator certificate. Throughout 2018, FF Tolbert was able to finish Paramedic school and obtain his Florida Paramedic License. He was also able to test and complete his Florida Fire Officer One Certification. FF Tolbert is a currently assigned to Engine 35/C-Watch as a nozzleman and steps up as driver when needed. He has proven a strong work ethic and technical efficiency on emergency calls and around the station while always being eager and willing to learn. FF Tolbert frequently steps up to participate in the department’s public events and always shows he wants what's best for the district. FF Tolbert's Achievements reflect great credit upon himself and are in the highest standards of Midway Fire District. Customer service is the foundation of everything we do! Administration is open during business hours of Monday-Friday, 8:00am-5:00pm.